I took this photo when my wife and I were in New Zealand a few years back. These volcanic geysers continually release boiling hot water onto the earth's surface and it is a truly amazing sight to see. In the natural, no one could walk through these gushing waters without getting burned. Yet in this Bible verse, God says that even if we walk through fire, we will not be burned. 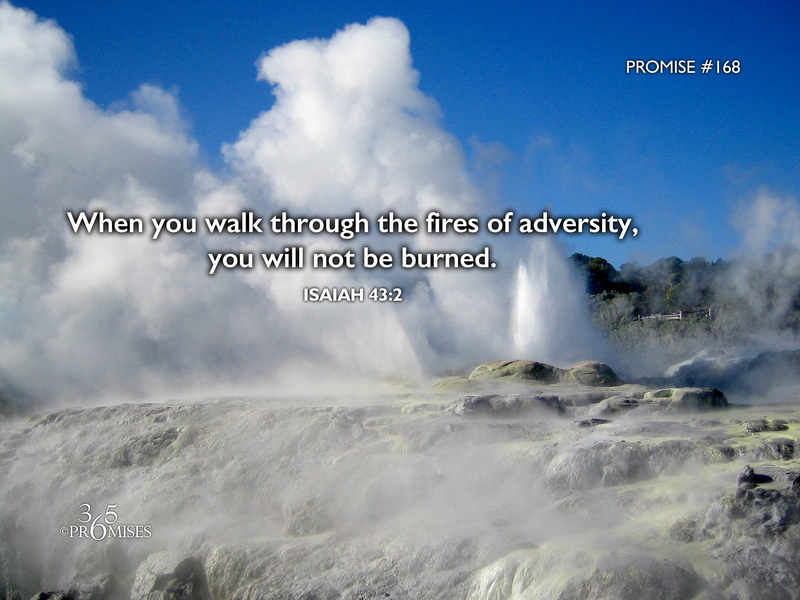 When I think of this promise, I do not think of passing through literal waters or fires, but the raging waters and fires of adversity that we all face in life. The NLT Bible calls it 'the fire of oppression' that we sometimes experience. I find great comfort in knowing that God promises that He will be with us as we go through our trials and that ultimately these trials will not overcome us. One day when Jesus comes back or we go home to be with Him, we will be in a place where there is no more pain or suffering. But in this life, we will continue to experience hardships simply because we live in a fallen world. The next time you go through a difficult experience, remember God's promise to be with you in the midst of the trial. My prayer is that the flames of adversity will not consume you as you pass through them. May you be kept safe in the secret place of the Most High (Psalm 91) no matter what life throws at you!